It was at a Cloud Dance Sunday at the Giant Olive Theatre that I first saw John Ross in his Man Down, then Wolfpack later at a Cloud Dance Festival. Thanks to Matthew Bourne and his friends who provided the initial funds to start the New Adventures Choreographer Award, Ross has stepped up to another level by winning the 2014 NACA Showcase award. 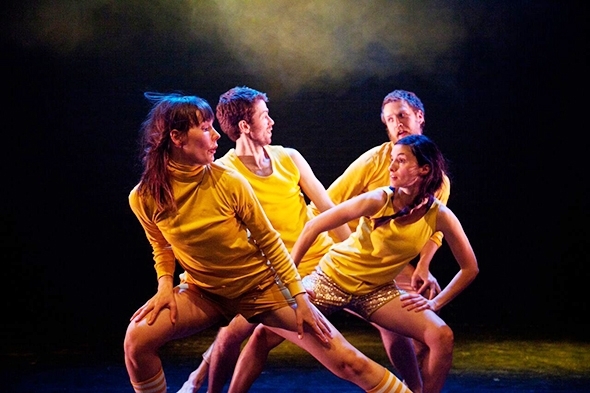 As a result his company, John Ross Dance, is presenting a triple bill at the grand Hackney Empire in a full stage production and a printed program to rival those at the Royal Opera House or Sadler’s Wells. Man Down is a visceral solo about a commissioned officer killed in Afghanistan, while Wolfpack is a slice of contemporary youth culture. Both works make intelligent use of theatre and dance that have pathos, drama and in the case of Wolfpack, a dark sense of humour. Neither, however, prepare me for the first work on the NACA showcase, Eclipse, that Lee Smikle, artistic director of Shoreditch Youth Dance Company, commissioned Ross to create on his dancers earlier this year (Smikle is also Ross’s producer and a former dancer in Matthew Bourne’s various companies, so this is a close family affair). Eclipse is pure dance with an inventiveness, excitement and musicality that is matched by the beauty and conviction of the Shoreditch dancers (Joey Barton, Kathy Collings, Hester Gill, Eimi Leggett, Joe Martin, Will Thompson, Elena Zube Perez and guest artist Jordan Ajadi) who take ownership of each detail of the dance. All the elements of the production come together seamlessly: the music is a blend of tracks by Greg Haines, If These Trees Could Talk and Ezio Bosso, while the costumes by Lez Brotherston (with original skirt design by Sara Rigden) serve the swirling rhythms of the dance to perfection. The work is based on the ancient Chinese notion that an eclipse is caused by a creature eating the sun and yes, there is a deep orange orb and a smaller black eclipse (both made by Amber Scarlett) that the dancers glide across each other to illustrate the tale. There are global echoes in an opening circle of dancers and a final tableau of arms like fiery tentacles appearing from behind the sun but in between Ross deploys a thrilling use of pattern, space and form in the choreography that to someone who has seen only Man Down and Wolfpack appears to arise out of nowhere, fully formed. Stunning. How do you follow that? At this point it is perhaps just as well that Matthew Bourne makes an appearance in front of the curtain to introduce the NACA awards, like a palate cleanser in between courses. He ends by introducing Wolfpack, reworked for a new cast (Fionn Cox Davies, Stephen Moynihan, Erik Nyberg and Lewis Wilkins) that depicts four lads who start off a little the worse for wear and work backwards through the rambunctious, phantasmagoric events that got them there. Wolfpack started life as a piece called Occupied for six male dancers in a male bathroom. Ross has evidently kept one of the flushing toilets (offstage) but otherwise leaves the location of the action to our imagination. You get the picture quite quickly, but it is Ross’s wealth of imagery (complemented by Emma Robinson’s surreal masks) and the uncomfortable juxtaposition of camaraderie and self-destruction in his characterization that keeps the performance constantly on the edge. The music, an eclectic blend of tracks by Modeselektor, Moderat, Goran Bregovic, Brian Eno and Fennezs, weaves through the work, sometimes in front of the action and sometimes behind, so Ross keeps our attention moving in subtle and some not so subtle ways, juggling all the elements at his disposal. Taken together, Eclipse and Wolfpack suggest Ross has the ability to create a full-scale West-End production, and that is almost what he provides with the second world premiere of the evening, Little Sheep. Inspired by the London riots of 2011, it is an outpouring of anger and frustration painted in large brush strokes that cover political incompetence and the impunity of social revolt. Lez Brotherston has moved the street on to the stage with crowd control barriers ready to be deployed where needed. Smoke hangs ominously over the set as does a large painted effigy of David Cameron with a blacked-out slogan that is revealed bit by ironic bit throughout the action (but only fully at the end). Given the cast is just seven strong (the four from Wolfpack plus Ana Mrdjanov, Maria Fonseca and Pauline Raineri) there is no possibility of massing police against rioters, but Ross appears to contradict the combined forces of Lucy Hansom’s ominous lighting, the foreboding set and the brooding complexity of the original score (by After They Left) with an uncharacteristic touch of caricature, first for the police (in full riot gear) and then the rioters. Strength in imagery returns with Maria Fonseca being dressed for action and with Fionn Cox-Davies reeling from a dose of tear gas, but it is only when Stephen Moynihan takes up the megaphone with an impassioned call to arms through to the final capitulaton of ideals that Ross’s conviction comes through. Little Sheep is his first large-scale creation but while the evidence of his past work indicates he is more than capable of handling the subject there are elements here that diminish its full expression and undermine his true talent.